As the calendar turns to December and I watch a few snow flakes float to the ground outside my window here in Michigan, I say goodbye to the growing season. No more fresh fruit to enjoy from the farmer’s market, besides those apples varieties that have long shelf lives. However the good news is that it’s time for citrus! The local grocery stores are beginning to fill up with citrus shipped in from much warmer climates. So I decided to keep track on the site what citrus I am finding in stores each month. 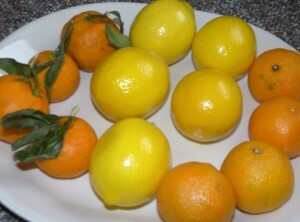 These are many varieties of oranges, grapefruit, and lemons to taste throughout the season. Lucky for me that season will take me right through to the spring. Anyway onto the list. I expect to update this list as the month goes on. I grouped the fruit by type. 1. Crates of Clementines can be easily found now, going for $4.99-$5.99 a crate. These little mandarin oranges have become a Christmas time favorite. Although I think the best tasting Clementines wouldn’t appear until we are in the New Year. Some of the Clementines I have seen have been imported from Spain. 2. 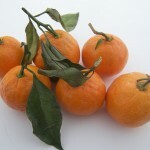 Satsumas are another mandarin that can be found now. I purchased some at Whole Foods the other day. They were being sold for $1.69/lb. These are most likely the orange you would have had out of a can. 3. Of course Naval oranges can be found year round, but I haven’t seen any yet that were grown domestically. So I will wait until the California ones appear in my stores. 4. I found some Fall Glo tangerines at Plum Market in Ann Arbor. I didn’t really care for them, or at least the one I got to try. Just didn’t have a good flavor and they are seeded. 5. One of my favorite oranges, the Cara Cara Navel should be arriving in stores before the end of the month. The same goes for blood oranges. I am not a big fan of grapefruit, but I will track them as for the sake of the site. I have seen Ruby Red on sale for $.99/lb at Busch’s in Saline, Michigan. Meyer Lemons are now available. I purchased a bag at Kroger for $1.25. These lemons are can used just as any other lemon is. They are more sweet and less acidic. Check out what I wrote about them last year. I have not seen anything but a traditional lime in my stores. We don’t get much in the way of variety of limes in my area.